No one hates robust and scalable applications, especially when the database is growing quickly, and millions of requests need to be served on a daily basis. Profiling is a form of program analysis to measure the time and resources consumed by the program. With profiling, we can spot the performance bottlenecks in the code and do something about them. There is a variety of profiling tools out there, each taking a different approach. There are two main types of profiling methods: Sampling and Instrumentation. In the sampling approach, the profiler takes samples of the call stack or the Memory at certain intervals, and updates its statistics. This method has a lesser effect on performance because it doesn’t modify the code at all. However, sampling has its overhead, which can be tuned by increasing the sampling frequency. In the instrumentation approach, profiling instructions are inserted into the code either by the programmer or automatically by the profiler (at bytecode level). This approach has a significant performance impact on the application but provides precise details of what exactly is happening in the code at runtime. Blackfire.io is the new generation of web profilers, which takes the automatic instrumentation approach, but without imposing a performance impact on our application. 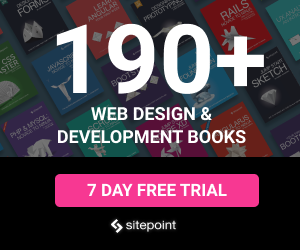 It’s been developed by Sensio Labs, the team behind the Symfony Framework. 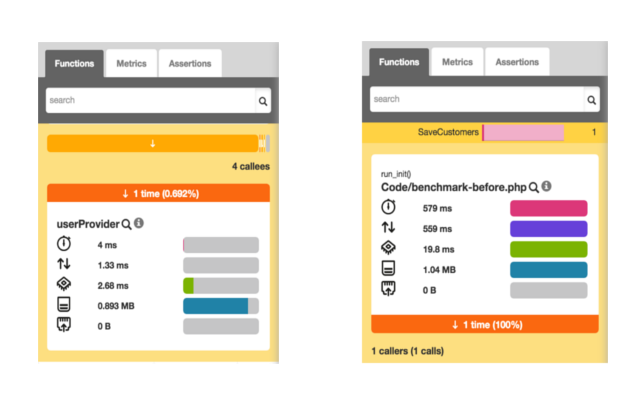 What makes Blackfire special is that it helps us continuously test our application’s performance without adding a single line of code. We can profile any PHP script using its fancy Google Chrome extension, or its command line tool. Blackfire is easy to install as it is supported by many cloud server providers and VM boxes, including Homestead. In this tutorial, we’re going to learn how we can use Blackfire to build faster applications. As usual, we’ll use Homestead Improved to set up our development environment. Once the VM is booted up and we’ve managed to ssh into the system using vagrant ssh, we can actually start using Blackfire! But wait, first we need to create a Blackfire account here. If we already have one, we can proceed by putting our Blackfire credentials inside homestead.yaml file, which is located in the root directory of our Vagrant box. To get our Blackfire credentials, we log in to Blackfire, click on the profile photo at top right side of the page, and click on My Credentials. The credentials are divided into two categories: Client Credentials and Server Credentials. - id: "Server Id here"
The Agent is a server-side daemon that aggregates and forwards the profile information to Blackfire. The Companion is Google Chrome extension used to run the profiler from the browser; it can be installed from this URL. The Client is the command line equivalent of the Companion, which we use to profile APIs, web services, web pages, etc. The Web-based Interface compares and visualizes the profile information in graph diagrams and tabular formats. The Probe, the Agent, the Client are pre-installed if we’re using the Homestead Improved Vagrant box. In this section, let’s profile a simple PHP script to see how fast or slow it is. To have realistic profile results, we’re going to write a small PHP script which contains database interactions and function calls. The script inserts 1,000 rows of random user data to a database table. Next, we create a data provider script which populates a JSON file with dummy data. We’ll use this JSON file within our main PHP script. Why aren’t we doing this in our main script? If we use Faker within our main script, the profile result will also include all the operations of Faker library. This will make our profile analysis more complicated, while we need something more bare-bones for this tutorial. The data provider script consists of a function which generates an array of dummy data, converts the array to JSON format, and saves it as a file. We can then run the data provider script with php UserProviderJSON.php. As a result, a file named users.json will be created within data directory of our project’s root directory. This file should contain 1,000 entries of random user information in JSON format. If everything has gone well so far, we can create the MySQL database to store the data. In the preceding code, we create a function named saveCustomers(), which accepts a PDO object as the argument. saveCustomers() calls userProvider() to load the contents of data/users.json into an array. Consequently, it iterates over the array’s elements and inserts them into the database one by one. To run the script, we access it via the /benchmark-before.php relative URL. If everything is in order, the MySQL table will be filled with one thousand rows of random user information. We will profile the script at its current state and set it as the reference profile, then we’ll do some micro-optimizations and run the profile again. To profile the page, on the benchmark-before.php page, we click on the Blackfire icon in the browser toolbar. Then in Compare With select box, we select Create New Reference and click on Profile. 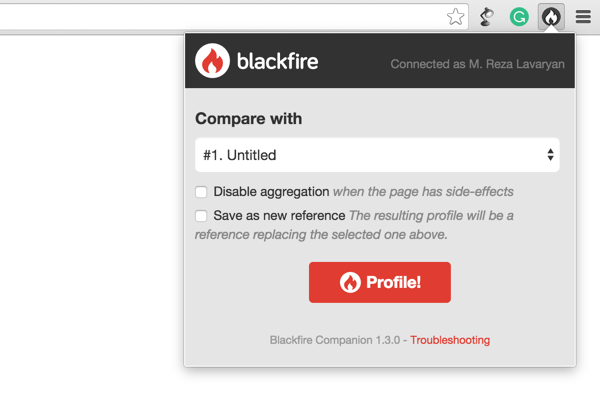 Note: To use Companion Chrome Extension, first, we need to make sure we’re logged into Blackfire.io. If everything is properly set up, we should see the Blackfire toolbar at the top of the page. To see the profile details, we click on View profile, on the right side of the Blackfire toolbar. 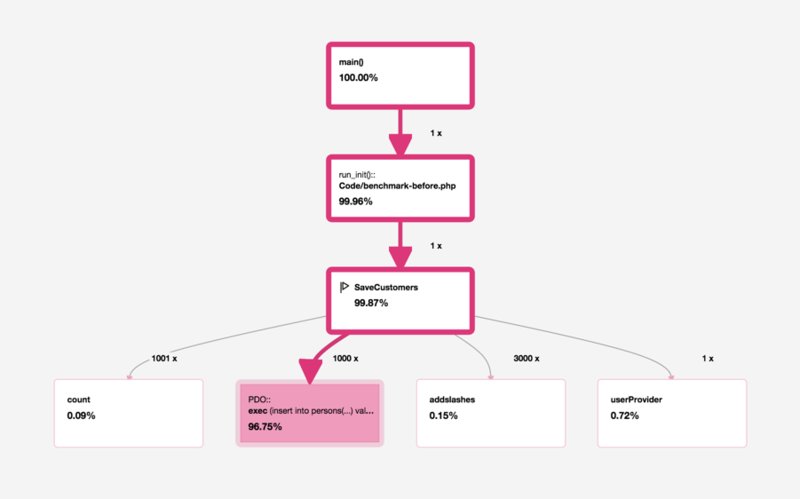 This section visualizes the execution flow of our code in a graph. Each node in the graph represents a function/method in our application with the amount of time it took to execute. All nodes in the graph are color-coded. The rule is simple: The darker this red color is, the more active this node is during each request. Colored borders show the application’s hot paths (the parts of our application that were most active during the profile) while the colored backgrounds show the most intense nodes. In many cases, hot paths don’t imply a performance bottleneck as some routines normally do the heavy lifting in our application. However, it is a good place to start when trying to locate the bottlenecks. By having a quick glance at the graph, we can spot the most active nodes. In our case, saveCustomers() has used 99.27% (including external calls) of the total time. PDO::exec (called by saveCustomers()) is the most intense node in the graph, as we’ve called this method one thousand times from saveCustomers(). It has taken 92.56% of the total time spent, according to the graph! By clicking on each node, we can see all the details about it (on the left panel) including the number of calls and spent time. As an example, we click on the saveCustomers() node. According to the screenshot above, we can see that this function has been called once (1 caller), and it has four callees (external function/method calls). There are also several horizontal bar charts, showing the inclusive/exclusive times for this node in each dimension (wall time, I/O time, Memory, CPU time, etc.). The darker shade shows the exclusive time while the lighter shade shows the inclusive time. If we move the mouse over the bars, we can see the time/percentage for each of these dimensions. We can also see the caller(s) of this function by clicking on the button underneath the 1 Callers (1 calls) label. If we scroll a bit down, we can also see the callee(s). Above the 4 callees label, there are several buttons next to each other with different widths. 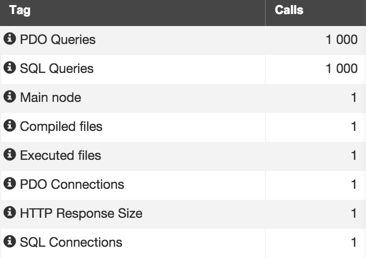 By clicking on each of these buttons, we’ll see the performance information for each external call from saveCustomer(). 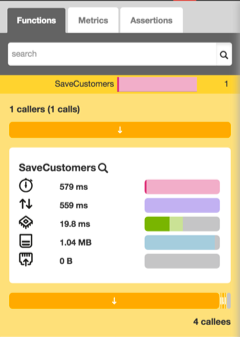 For instance, userProvider() is one of the callees of saveCustomers() . Blackfire provides some metrics out of the box allowing us to evaluate our application’s performance from other perspectives as well, like SQL queries, PDO connections, HTTP response size, the number of compiled and executed files, just to name a few. These metrics can be used in continuous performance testing. We’ll get to that shortly. We call this file benchmark-after.php and run it in the browser. Now, we run the profiler again. This time in the Compare with select box, we choose our reference profile. When the profiling is done, we click on View Comparisons to go to the web interface. As we can see, the web interface is a bit different now since we’re comparing two different profiles. By taking a quick look at the toolbar, we can see that the wall time has been significantly optimized by 98% (from 578 ms to 14 ms) and the number of database requests is reduced to only one! The memory usage has been increased by 97% though (2.42 MB). By looking at the graph, we can also see that the performance has improved. The nodes in this diagram are colored blue. The negative value in each node means the amount of time we have saved. In our case PDO::exec has been impacted most (time reduced by 555 ms). By clicking the node, we can see its details in the left pane. The performance information of this profile and the reference profile are displayed side by side. By clicking on the metric tab, we can see the improvements from other perspectives. For example, in our last profile run, the PDO Queries has been reduced to only one. Well, this wasn’t a lesson in performance tuning, but good enough to scratch the surface of Blackfire. Along with the Companion, Blackfire provides a nifty command line utility called blackfire allowing us to profile any PHP script including web pages, web services, API calls or command-line scripts right from the terminal. To have more precise results, we can take several samples of the same request by passing the --sample option, followed by the number of samples that we want. Blackfire takes 10 samples by default so don’t be surprised if your database table contains 11,000 rows after the first profile run. The reference profile id is available in the web interface, or as part of the profile output when using --new-reference option. All the options used with the curl sub-command can also be used with run. Another great feature of Blackfire is its continuous performance testing. As mentioned earlier, Blackfire provides a variety of metrics out of the box which we can use to write performance tests. This feature is only available to premium users, but it is also available as a two-week trial. Assertions can be on time dimensions or other dimensions like the number of database requests, memory usage or response size. All the tests should be in .blackfire.yml within our project’s root directory. As we can see, all the tests should be under the tests main key. A regular expression (path) that all HTTP request must match, for the test to be executed. A set of assertions which consist of metrics and assertion values. Each time the profiler is run for a project containing the .blackfire.yml file, Blackfire automatically runs all the tests and reflects the result in the web interface (Assertion tab in the left panel). The above test is run for the home page (/). In the assertions, we make sure that no database request is made on the home page, memory usage does not exceed 10 MB and the response size is less than 100 KB. To learn more about assertions, refer to the Assertion reference. We can also have custom metrics in our assertions, which is fully covered in the documentation. Note: to validate the tests, we can use Blackfire’s Validator. 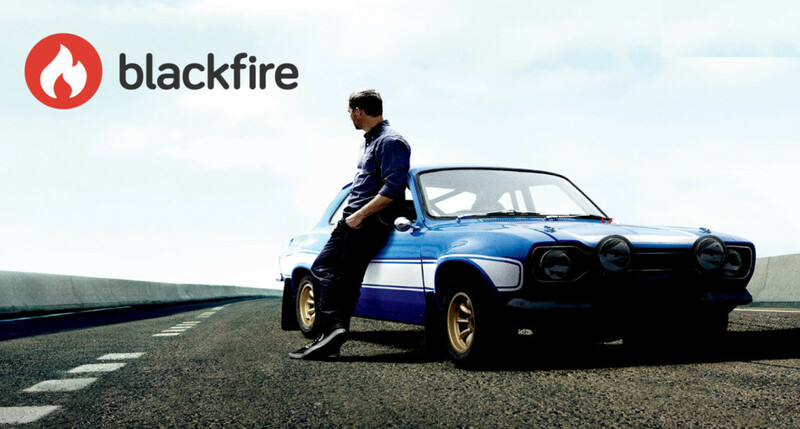 Blackfire.io is a powerful web profiler which instruments applications without adding a single line of code. It consists of five main components: the Probe, The Agent, The Companion, CLI tool and the web interface. The Probe and the Agent are responsible for instrumenting the code and forwarding the profile results to the Blackfire server. We can profile an application either by using Companion or blackfire command line utility. Blackfire provides a web interface which visualizes the details of the profile result. We can set a profile as a reference, and then use that as a performance baseline to compare against future profiles.